Use this page to help answer some of the most frequently asked questions about ASCO's virtual products. Can't find the email with your product link(s)? Check your spam filter and make sure customerservice@asco.org is not blocked. If you have blocked the sender or domain (asco.org) you will not receive the emails. Contact customerservice@asco.org with your order number if you still cannot find the email. Not sure how to access your product(s)? 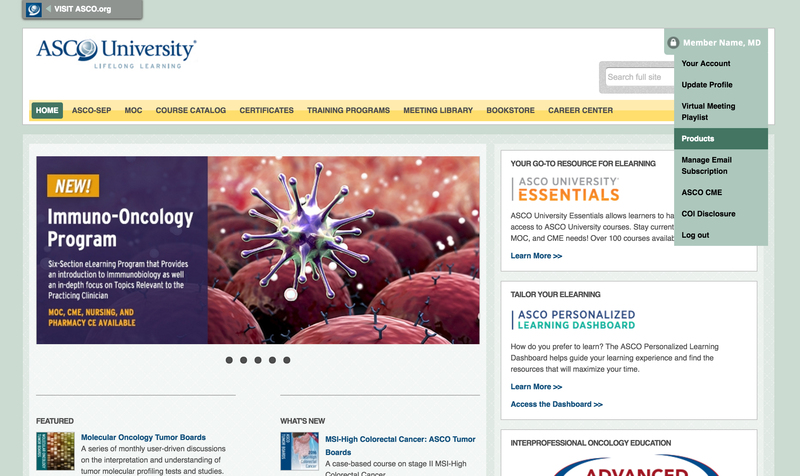 Sign in to university.asco.org using your asco.org credentials → Click on your name in the top right of the page → Click on Products. You will see all virtual products activated on your account here. You can enter your username to recover your password. If you cannot remember your username you can enter your email address to recover your username. You must use the email associated with your ASCO account to retrieve this information. For security reasons ASCO does not send both username and password in one email. You may need to process two requests if you cannot remember either piece of information.